Three days in a row over 70 degrees… bliss. Things are finally starting to happen around here. 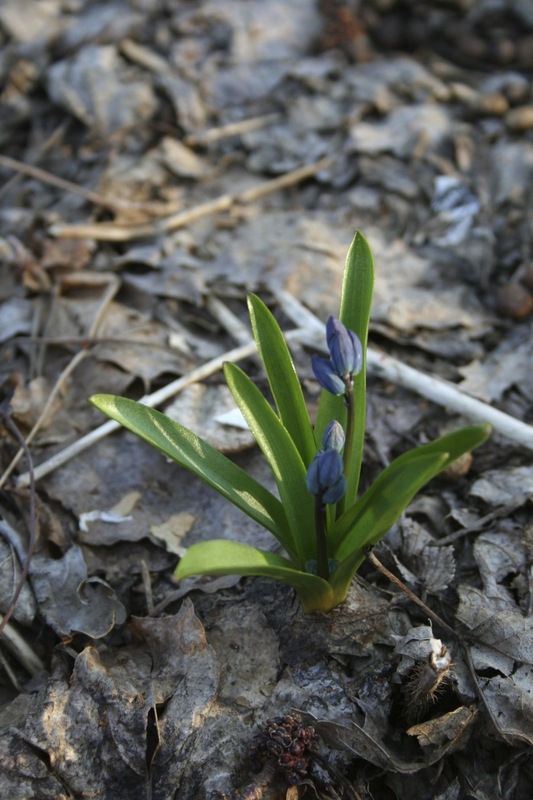 Siberian squill (Scilla siberica) are blooming in the raspberry patch. Tulips, protected from rabbits by an every-other-day sprinkling of human hair. 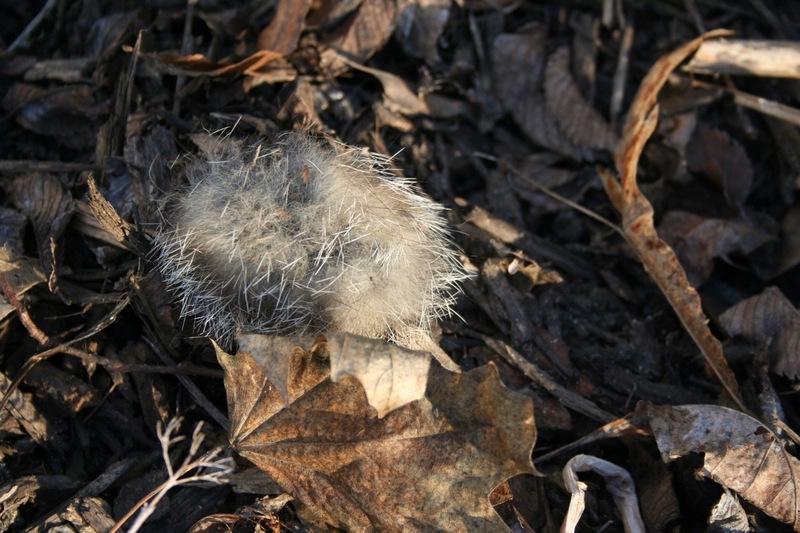 It fortunately blends in with the mulch. Not all is rosy, of course. 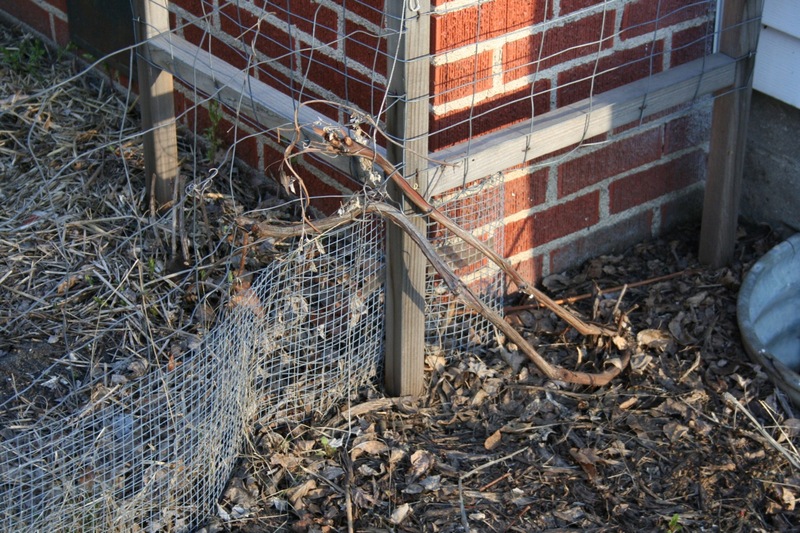 Here is all that remains of what was, last year, a 12 foot long grapevine. Devoured by rabbits. At least they left a fertilizing gift all around the edge of the garden. Speaking of rabbits, I wonder what got this one? A bit of tail was all that remained. I shed zero tears for it. Adam noticed some Cooper’s hawks are back in the neighborhood, so maybe they’re helping us out. 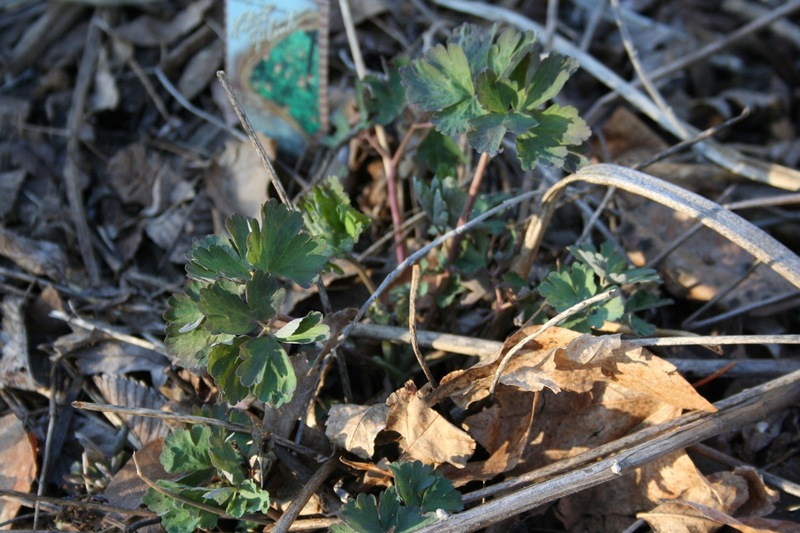 Wild columbine (Aquilegia canadensis) is coming up. We now have it in at least 5 spots in our garden. It could not be easier to grow, and is tolerant of many different light scenarios. Doesn’t seem to spread that much, either. Bonus: it provides nectar for hummingbirds and butterflies. I think it’s safe to say we’ll have both chives and a first picking of lettuce within a week. 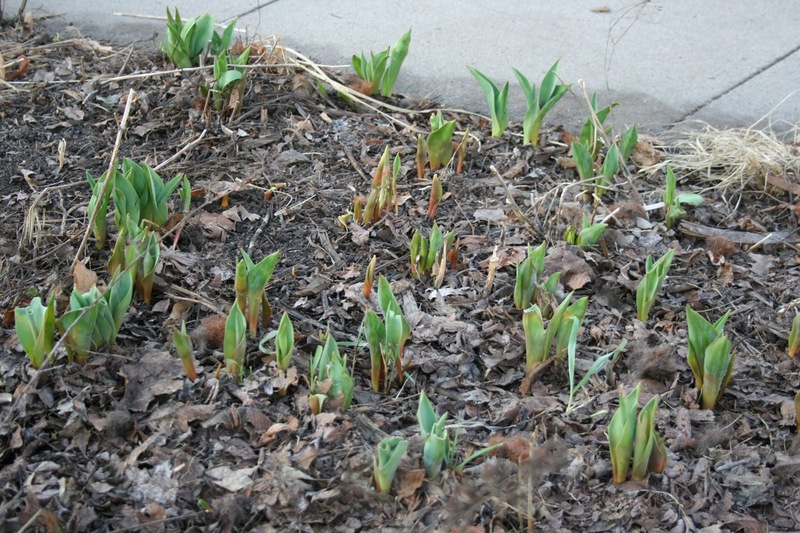 Hurray for spring! Categories: Gardening, Practical | Tags: native plants | Permalink. We had a pretty crappy week of freezing rain, sleet, snow, and everything in between. 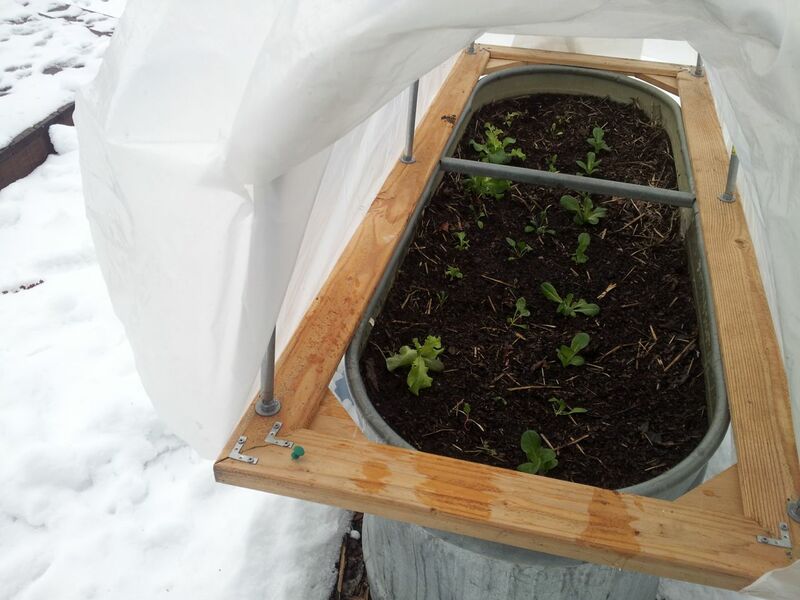 Happy to report that even though we (once again) have snow on the ground and below-freezing night-time temperatures, my lettuce and other greens are all staying happy and getting settled in to the hoop house. Spring: I found a tiny glimpse of it. Oh normal Minnesota spring, you’ve been vexing me. I started seeds in February. 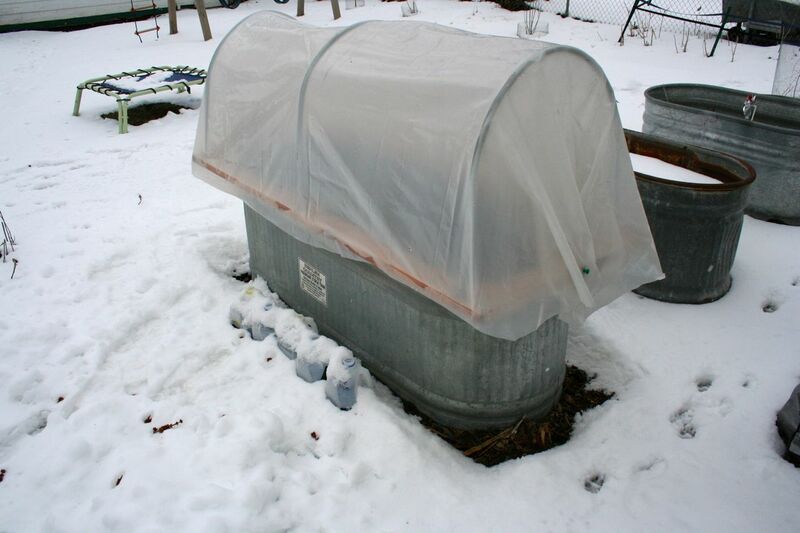 The plan at that time was to get the hoop house on top of the stock tank in early March, to give it a few weeks of protection from snow and hope that it would thaw quickly. Then we had a flooded, frozen garage, and couldn’t access the hoop house (or my bike) for a good part of March. 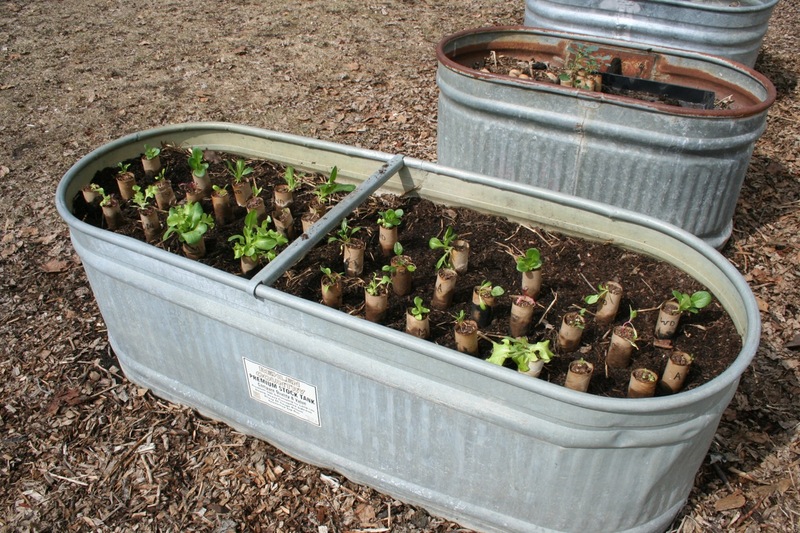 On Easter Sunday, with seedlings quickly outgrowing their starting containers, I bought some bagged compost (my pile is still frozen) and went out there with my shovel. The top 2-3 inches were fine, but the soil was frozen solid beneath that. All week long I cursed it, pleaded with it, poured water on it, and generally picked at it with my shovel, waiting for that ice to clear up. It finally *mostly* did overnight last night, and we had a beautiful 50 degree (F) sunny day today, so in went the plants! 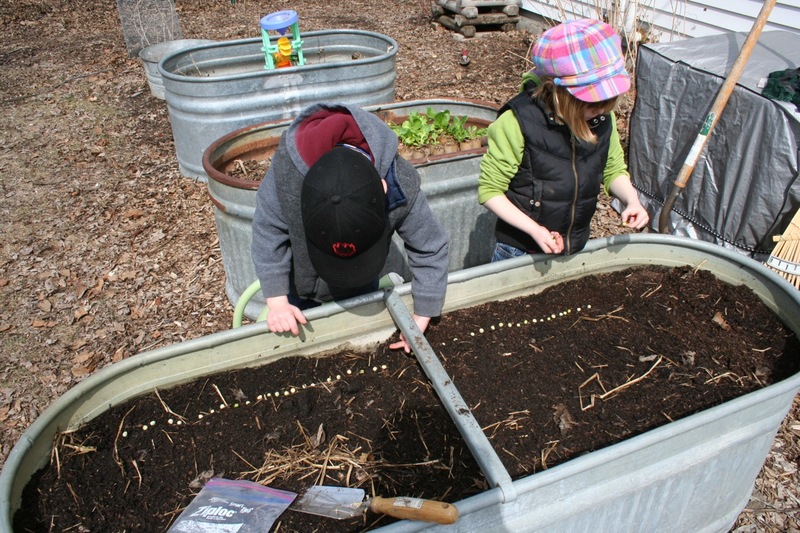 My junior master gardeners took a break from making mud pies and helped me with snow peas at the back of the tank. I’d been soaking the seeds in a wet paper towel for a few days in the refrigerator. I get much better germination rates from peas when I pre-soak. 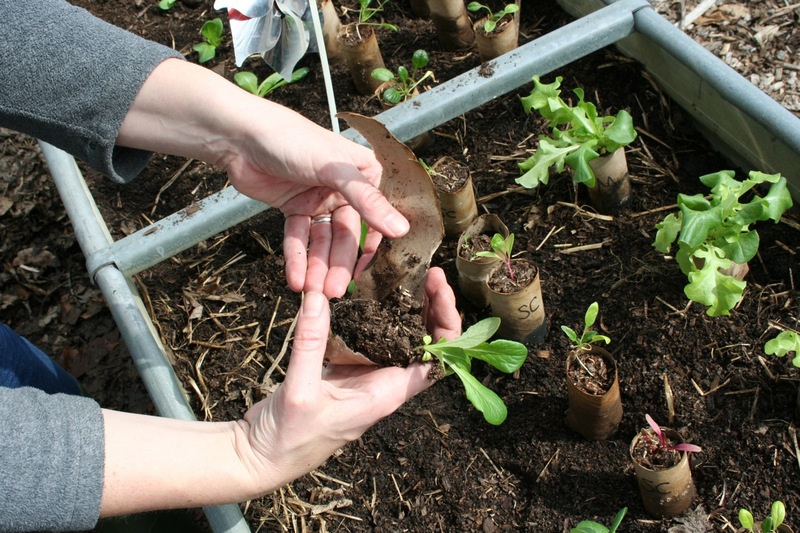 I planted a few winter density lettuces in their roll, but I quickly realized they would probably be happier if I unrolled the roll and plopped just the root ball in. Some held together better than others. The wild arugula, in particular, was a disaster. I don’t think it’s worth it to start that stuff inside—it does not thrive under artificial light. 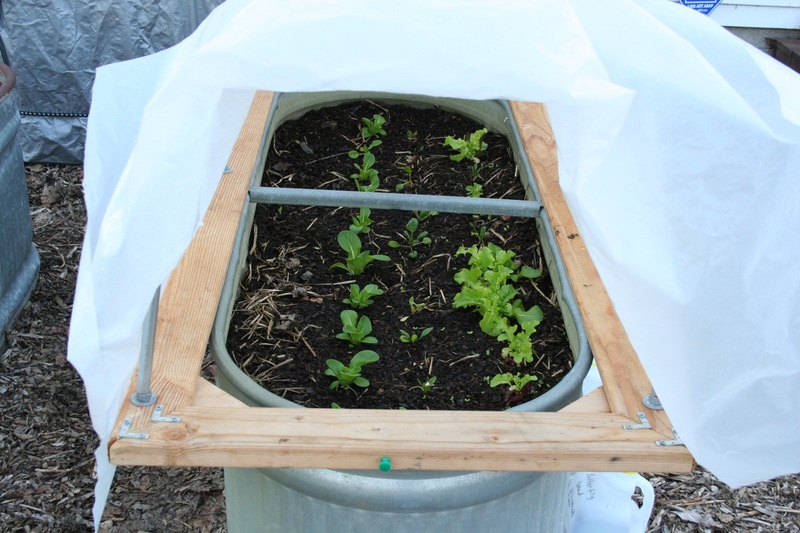 Everything planted, extra mesclun lettuce seed scattered, watered, and hoop house added to the top. 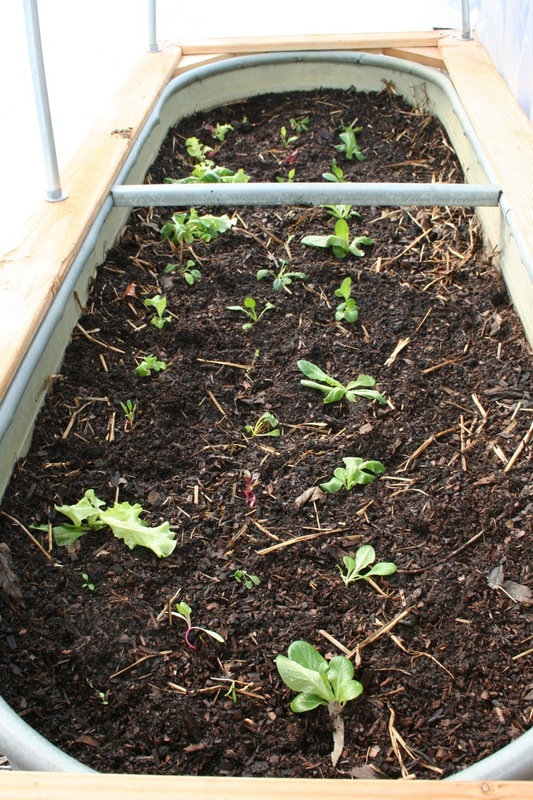 The plants were overdue for transplanting; as you can see many of them look rather floppy and pathetic. But, in the past, I’ve seen them mostly recover from this state. They are in an environment that is protected from wind and pouring rain, but will still get plenty of sunlight (around 6-8 hours a day).